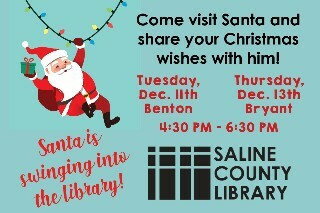 The Saline County Library invites you to come visit Santa and share your Christmas wishes. All children visiting Santa will receive a Christmas gift from the library. Bring your camera to take photos of this special visit. Christmas crafts and activities will also be available for patrons to enjoy. See the times and locations below.